There are smart marketers everywhere testing many smart ideas — and bad ones. The problem with ideas is that they are unreliable and unpredictable. Knowing how to test is only half of the equation. As marketing tools and technology evolve rapidly offering new, more powerful ways to measure consumer behavior and conduct more sophisticated testing, it is becoming more important than ever to have a reliable system for deciding what to test. Without a guiding framework, we are left to draw ideas almost arbitrarily from competitors, brainstorms, colleagues, books and any other sources without truly understanding what makes them good, bad or successful. Ideas are unpredictable because until you can articulate a forceful “because” statement to why your ideas will work, regardless of how good, they are nothing more than a guess, albeit educated, but most often not by the customer. 20+ years of in-depth research, testing, optimization and over 20,000+ sales path experiments have taught us that there is an answer to this problem, and that answer involves rethinking how we view testing and optimization. This short article touches on the keynote message MECLABS Institute’s founder Flint McGlaughlin will give at the upcoming 2018 A/B Testing Summit virtual conference on December 12-13th. You can register for free at the link above. Marketers don’t need better ideas; they need a better understanding of their customer. So if understanding your customer is the key to efficient and effective optimization and ideas aren’t reliable or predictable, what then? We begin with the process of intensively analyzing existing data, metrics, reports and research to construct our best Customer Theory, which is the articulation of our understanding of our customer and their behavior toward our offer. Let’s look at some examples of what to avoid in your testing, along with good examples of hypotheses. The golden rule of optimization is “Specificity converts.” The more specific/relevant you can be to the individual wants and needs of your ideal customer, the more likely the probability of conversion. To be as specific and relevant as possible to a consumer, we use testing not as merely an idea-trial hoping for positive results, but as a mechanism to fill in the gaps of our understanding that existing data can’t answer. Our understanding of the customer is what powers the efficiency and efficacy of our testing. Smart ideas only work sometimes, but a framework based on understanding your customer will yield more consistent, more rewarding results that only improve over time. 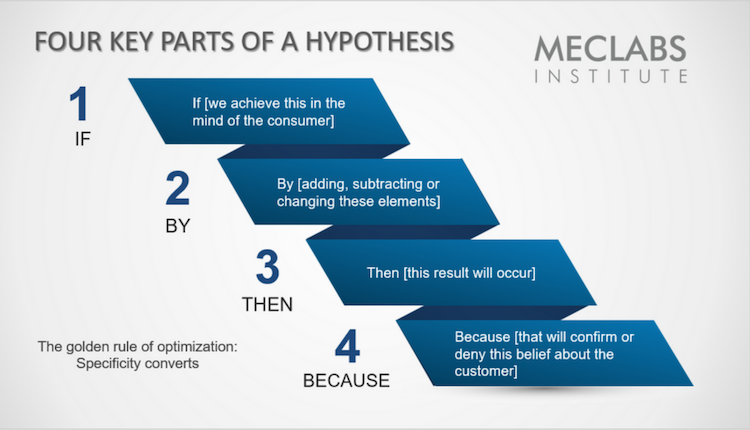 The first key to rethinking your approach to optimization is to construct a robust customer theory articulating your best understanding of your customer. From this, you can transform your ideas into hypotheses that will begin producing invaluable insights to lay the groundwork for how you communicate with your customer. Quin McGlaughlin is currently a Senior Optimization Analyst at MECLABS Institute and full-time distance student at Harvard University, studying psychology and business. He has worked on projects for some of MECLABS’ largest clients ranging from Fortune 50 companies to defense contractors, not-for-profits, major ecommerce organizations and others. He has also served as Vice Chair of Digital Strategy for the Harvard Extension Student Association and provided marketing consulting for small and mid-size businesses.